Skin secretions from the Indian frog Hydrophylax bahuvistara contain antiviral peptides. One peptide, which Emory researchers named urumin, can physicially destroy H1 influenza virions. Combination photo courtesy of Sanil George and Jessica Shartouny. 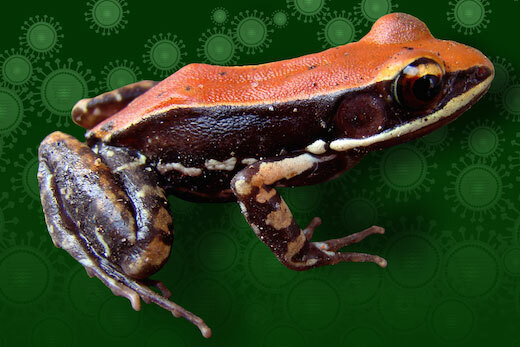 A component of the skin mucus secreted by South Indian frogs can kill the H1 variety of influenza viruses, researchers from Emory Vaccine Center and the Rajiv Gandhi Center for Biotechnology in India have discovered. Frogs' skins were known to secrete peptides that defend them against bacteria. The finding, published Tuesday in Immunity, suggests that the peptides represent a resource for antiviral drug discovery as well. Jacob and his colleagues named one of the antiviral peptides they identified urumin, after a whip-like sword called "urumi" used in southern India centuries ago. Urumin was found in skin secretions from the Indian frog Hydrophylax bahuvistara, which were collected after mild electrical stimulation. "I was almost knocked off my chair," Jacob says. "In the beginning, I thought that when you do drug discovery, you have to go through thousands of drug candidates, even a million, before you get 1 or 2 hits. And here we did 32 peptides, and we had 4 hits." Developing antimicrobial peptides into effective drugs has been a challenge in the past, partly because enzymes in the body can break them down. Jacob's lab is now exploring ways to stabilize antiviral peptides such as urumin, as well as looking for frog-derived peptides that are active against other viruses like dengue and Zika. Emory co-authors include research associate Song Hee Lee, PhD, senior research associate Ali Ellebedy, PhD and assistant professors Jens Wrammert, PhD and Anice Lowen, PhD. Holthausen is in the Immunology and Molecular Pathogenesis graduate program. Jacob's lab is based at Yerkes National Primate Research Center.